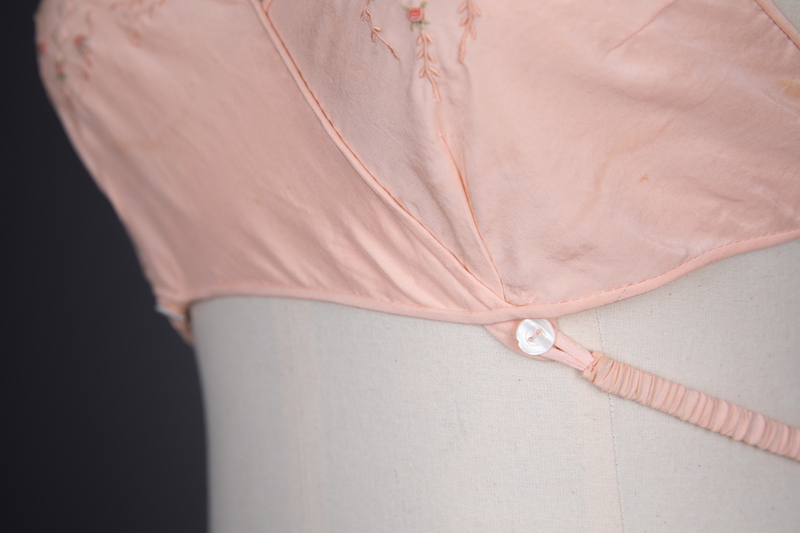 A soft cup style bra based on the ‘Kestos’ bra of the late 1920s. 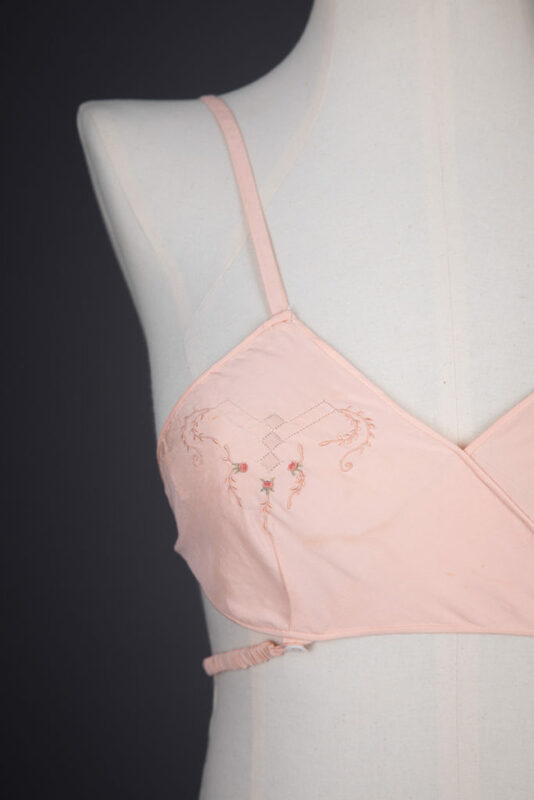 Kestos was trademarked in 1925 and the bra was arguably one of the first commercially produced bras with seperated cups. It marked the shift in ideal body aesthetic from the flattened bust of the 1920s to the more voluptuous ideal of the 1930s. The Kestos bra is based on two, lightly darted triangle cups, overlapping at the centre front. 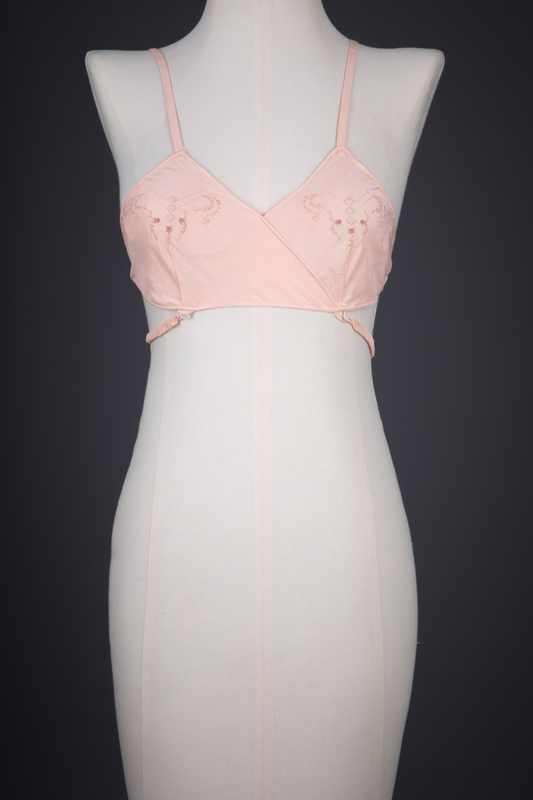 Elasticated straps cross at the centre back, fastening around the front with buttons underneath the bust point. The bra was designed by Rosalind Klin, a Polish-born designer residing in London. 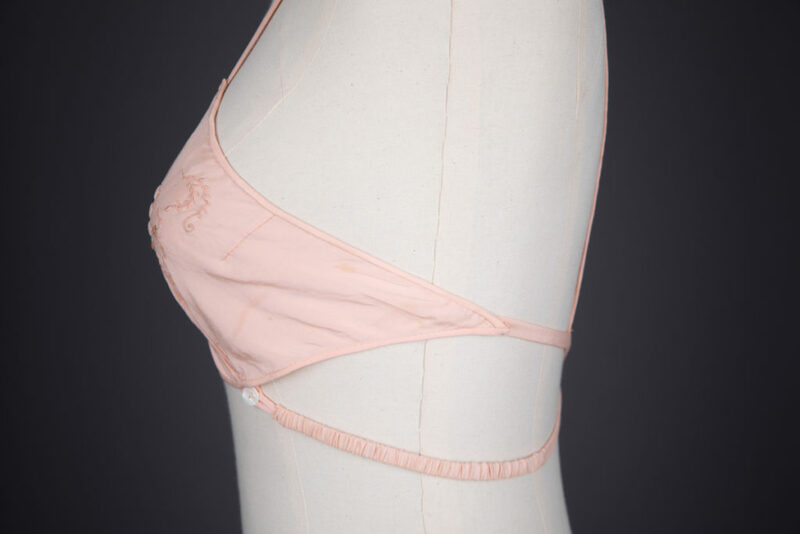 The Kestos bra remained popular through the 1930s and 1940s. 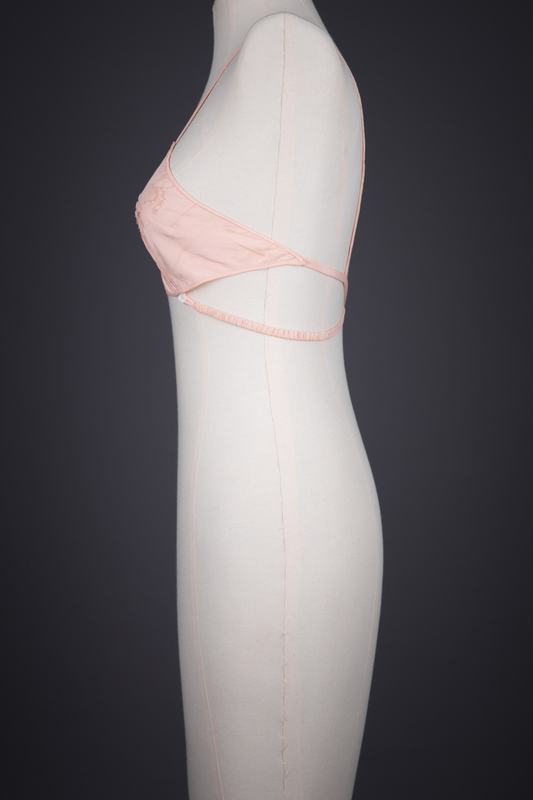 Although the Kestos brand produced many different styles, this bra shape became generically known as ‘The Kestos’. 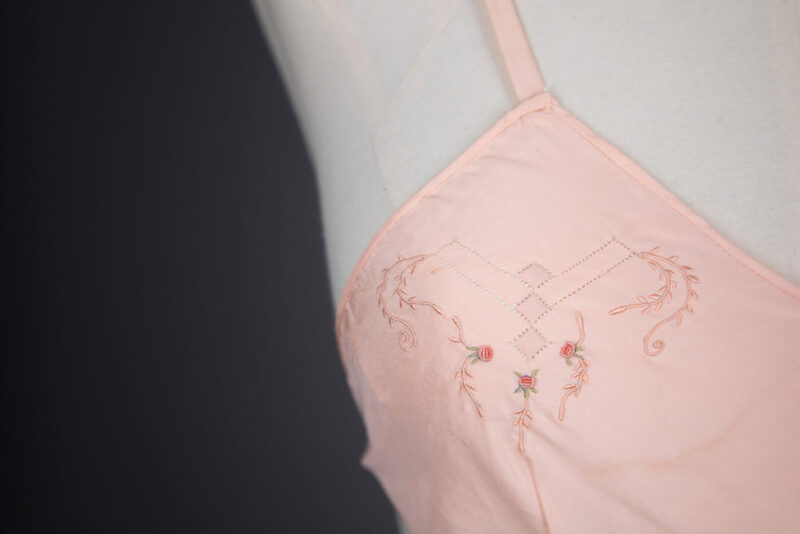 This particular bra is not an authentic branded Kestos, but was most likely custom made as a one-off by a seamstress for an individual wealthy client. The garment is made with a luxurious attention to detail, with hand stitched finishing throughout. Each cup is embellished with intricate hand embroidery techniques, including satin stitch, french knots and drawn thread work. 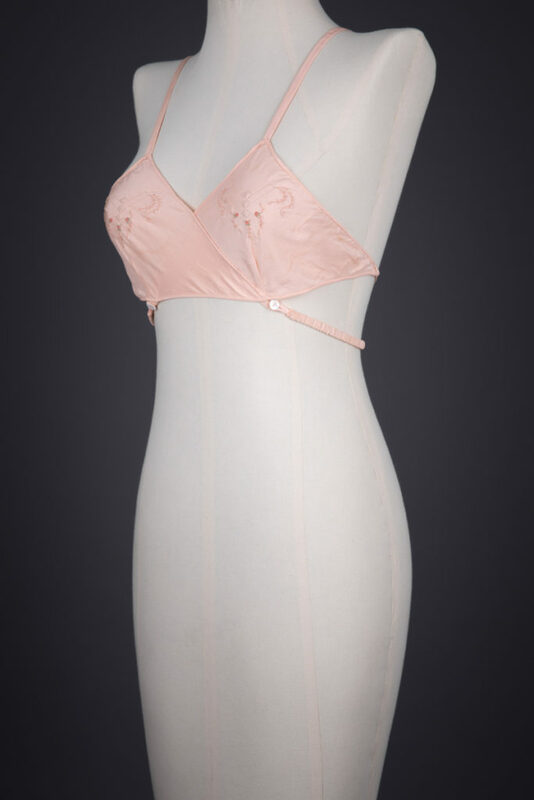 The bra is made entirely of silk crepe, with small pieces of elastic inserted into the underbust straps for fit flexibility. It fastens with shell buttons under the bust.